We love eateries like this - family-run, with enthusiasm and real pride in what's served. 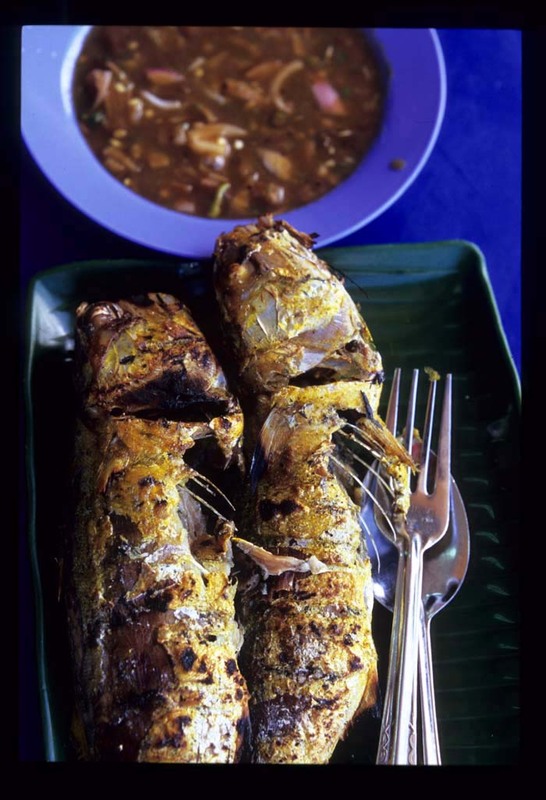 There's grilled fish and then there's lovingly grilled fish, and the grilled fish served at Ikan Bakar Pak Din is of the latter variety. The food is why we're here, of course, but the assorted members of the Pak Din clan that keep this place humming are so friendly and so obviously happy to see us enjoying their grub that we can't help but feel we've found a keeper. Family head Pak Din mans the grill set up outside the back of the stall. 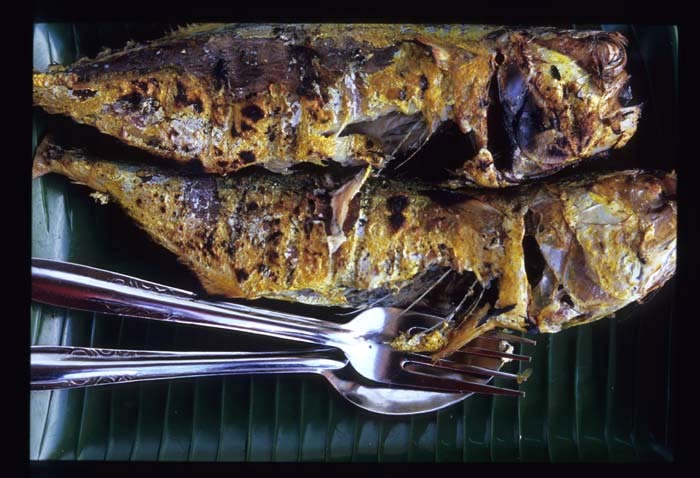 His approach to ikan bakar (grilled fish) falls into the category of 'simple is best' - no post-BBQ saucing, no complicated pre-BBQ marinades or rubs, just a touch of salt, pepper, and turmeric. The result is plain perfection: a grilled fish with moist, aromatic flesh enclosed in skin that's crispy in some spots, charred in others, and entirely delicious. Though this fish doesn't need a dip, Pak Din's is a stunner, sour-sweet and fishy-spicy from sugar, tamarind, belacan, small fresh chilies, and thickly sliced red shallots. Happily, it's served in generous portions, which means plenty left to eat with rice after the fish bones are picked clean. 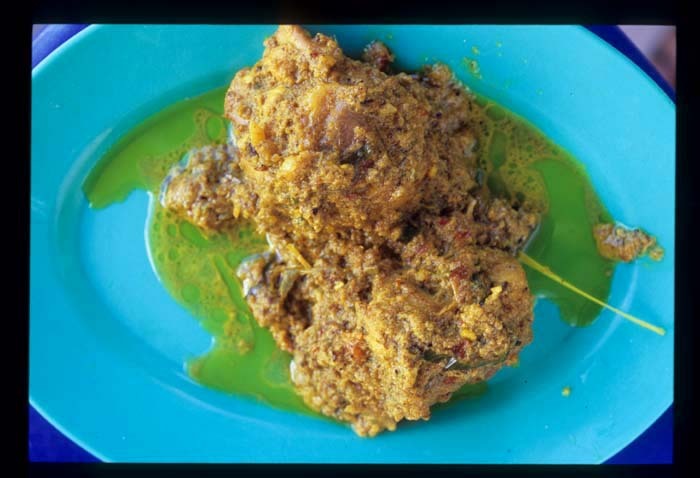 and that's Mrs. Pak Din's rendang ayam, chicken stewed in coconut milk with chilies and herbs. We were lucky enough to arrive just as a batch was coming off the fire. The memory of its coconuty richness balanced by a fresh lemongrass-iness lingers two weeks later (and there are a few takeaway servings stashed our freezer). Pak Din has been in business for about a decade, having moved just a few years ago from a portable set-up under a tree to this bricks-and-mortar stall in a tiny food court at the edge of the Lake Gardens. 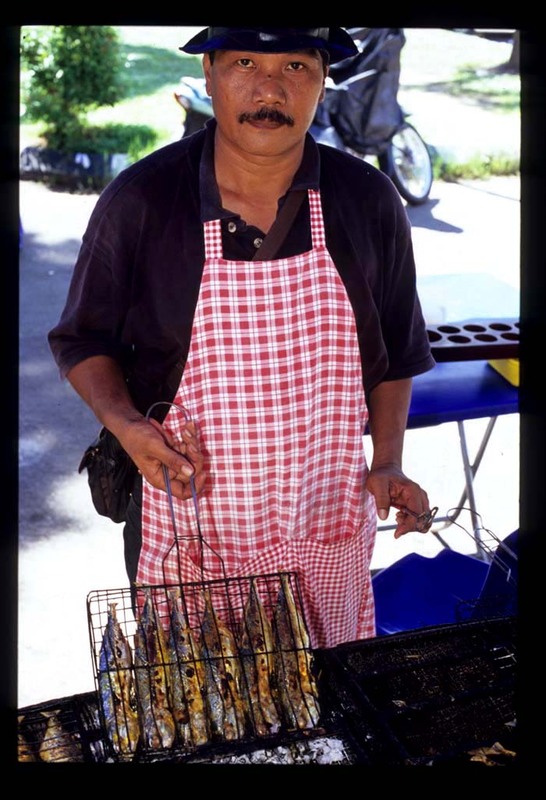 Business is going well ... which means plenty of ikan bakar and rendang ayam in our future. 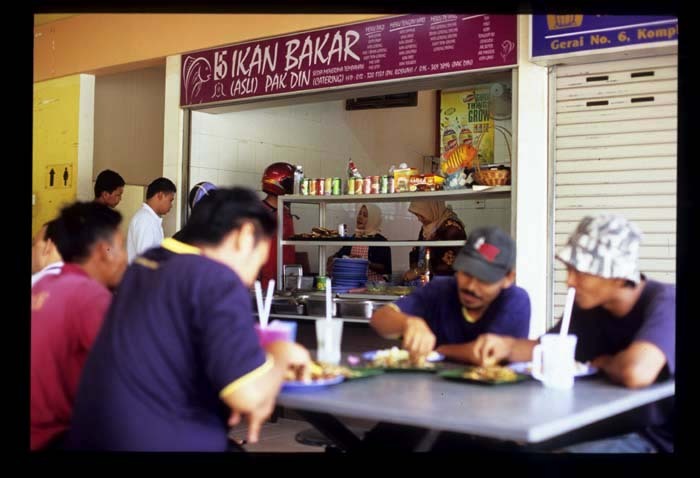 Ikan Bakar Pak Din, food court on Jalan Cenderasari near police station. Open early morning till around 3pm (but arrive by 12:30 for the best fish selection). Closed Sundays and holidays. I absolutely love his ikan bakar - ever since we discovered it, I don't go to Bellamy anymore. My fav is the Ikan Keli (Catfish). Another must is the Nasi Lemak next door and the tea from the first stall. I have often wondered about the other stalls at this hawker complex, but I've always made a bee line for the Tanglin Nasi Lemak (which I've been eating since 1981!) which is the corner stall nearest to the car park area. Have you tried it? It's true, Bee, that the selection in the US isn't as astounding as it is here. But I'd look beyond the Asian markets ... where are restaurants getting their fish? We found a (non-Asian) v. small neighborhood place in Berkeley CA that had a small, but always top-notch variety on hand. I miss big gorgeous mussels for $4.99 a pound! i'd like to know the operation day/hrs of the stall. Very good web site, great work and thank you for your service.+!